This VINSIC 20000mAh Ultra-slim Power Bank is designed with two USB output ports will quickly and effectively help to solve the low power problem for your digital device while traveling out. The super high capacity 20000mAh power bank will conveniently solve the low power problem for your digital device while on-the-go. Never heard of the brand but the design looks nice lol. 481g, so more for a bag than a pocket. How big this? Looks huge! you'd think they would put the dimensions on the product page wouldn't you. Love this thing. Slim but large, fits the bill and charges as advertised. Sleek blue led display and charges relatively quickly. I take it on business trips and never have to worry about my smartphone running out of power mid-flight. I take it on business trips and never have to worry about my smartphone … I take it on business trips and never have to worry about my smartphone running out of power mid-flight. I took an Anker 3300mah (a cylindrical design with a button on the top which lights up green when pressed) in my hand luggage, through Rome Ciampino and I'd left the charger cable plugged into the top of it. Needless to say there was a point, when security pulled me to one side, that I wish I'd kept a change of underwear and toilet roll in my carry on. I'd be surprised if it actually tested as 50000, Chinese no-name batteries just tend to come up with a massive number that has no relation to the capacity and shove it on the box. I've got the EC Technology one and it's great. I usually get generic no-name Chinese powerbanks from tinydeal or fasttech, a few dollars and then I just pop some Samsung 16850 batteries in. Same batteries my e-cigarette uses, so they effectively double as chargers :P.
I am glad you mentioned this are these allowed on planes? you know in your laptop bag/ flight bag? 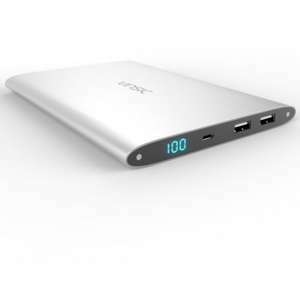 Or get this one for less … Or get this one for less http://www.amazon.co.uk/EC-Technology%C2%AE-18000mAh-Dual-Port-Tablets-Silver/dp/B00LVTUX06I've got the EC Technology one and it's great. It's less because it's got less power. Oh man that didn't last long! Annoys me when Amazon do this! Mine just arrived. Bigger and heavier than I thought which is not a problem. It weighs 540g not 449g as claimed and is about the size of a small Kindle. Mine arrived with a 95% charge already in it. Mines also arrived. Works a dream! Mine too all good. Any views on charging it? Must it be connected to a computer USB port or could I connect it to the wall via Apple / Samsung charger? I usually get generic no-name Chinese powerbanks from tinydeal or … I usually get generic no-name Chinese powerbanks from tinydeal or fasttech, a few dollars and then I just pop some Samsung 16850 batteries in. Same batteries my e-cigarette uses, so they effectively double as chargers :P.
You mean 18650? Where do you get your batteries? I've only ever bought a pair of 18650s and they cost me £22. Mine too all good. Any views on charging it? Must it be connected to a … Mine too all good. Any views on charging it? Must it be connected to a computer USB port or could I connect it to the wall via Apple / Samsung charger? I would charge it via a 2.1amp or 2.4amp charger at the mains. I would imagine it would take forever to charge from a USB port on a computer. Which I would guess is below 1amp. I would charge it via a 2.1amp or 2.4amp charger at the mains. I would … I would charge it via a 2.1amp or 2.4amp charger at the mains. I would imagine it would take forever to charge from a USB port on a computer. Which I would guess is below 1amp. ok thanks, this isn't something i know about. So using my iPad charger should be fine (i believe that's 2.1amp). Haven't had a power bank before and didn't fancy it exploding or anything! That one won't be anything like 20000mAh! Also look at the pictures, its practically falling apart sat there! … I'd be surprised if it actually tested as 50000, Chinese no-name batteries just tend to come up with a massive number that has no relation to the capacity and shove it on the box. And blow up after 15 min.